Investors and investment advisors have always touted diversification through investments within the traditional asset classes such as stocks, bonds and cash. Most will use investment products like mutual funds or third party managed accounts to gain professional expertise in choosing the individual investments made within these asset classes. But no matter what the investment vehicle, the allocation should always be aligned with your risk tolerance and investing objectives. Most individual investors have always allocated their funds in both their brokerage accounts and retirement accounts in this fashion. I have found the common mistake investors make in allocating funds in their portfolios is that most of the time, they hold similar allocations in all of their accounts, thus duplicating their portfolio allocation and not maximizing the benefits of their retirement accounts. This is simply because they have been advised that a model portfolio allocation is best suited for their risk tolerance and overall investor profile. This is usually due to the limited investment solutions offered by large firms and banks. However, including non-traditional asset classes can add additional diversification to an otherwise conventional portfolio. 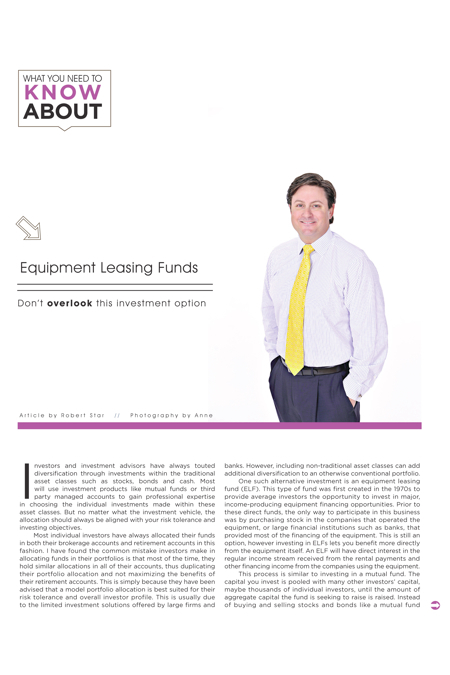 One such alternative investment is an equipment leasing fund (ELF). This type of fund was first created in the 1970s to provide average investors the opportunity to invest in major, income-producing equipment financing opportunities. Prior to these direct funds, the only way to participate in this business was by purchasing stock in the companies that operated the equipment, or large financial institutions such as banks, that provided most of the financing of the equipment. This is still an option, however investing in ELFs lets you benefit more directly from the equipment itself. An ELF will have direct interest in the regular income stream received from the rental payments and other financing income from the companies using the equipment. This process is similar to investing in a mutual fund. The capital you invest is pooled with many other investors’ capital, maybe thousands of individual investors, until the amount of aggregate capital the fund is seeking to raise is raised. Instead of buying and selling stocks and bonds like a mutual fund manager, your ELF manager will purchase large business-essential equipment that a company needs for its business and then leases it to them. The opportunities in this business are greater than ever before as the large financial institutions have limited their lending and continue to deleverage their balance sheets. Companies of all sizes seek financing for business-essential equipment. I refer to the equipment as “business-essential” because we are not talking about leasing a copier or computers for the office. For example, instead of paying $25 million for a shipping vessel, a company can finance it over 10 years by paying $2 million per year plus interest and other financing expenses. This allows a shipping company to expand its business without paying large upfront costs and keeps their cash free to be used in other productive ways. This equipment is business-essential, because without it, they are not able to generate revenue from shipping goods. If they default on their payments, this equipment is easily repossessed and leased or sold to other companies that may need the equipment. This is just one example of business-essential equipment that could also include mining equipment, trucks, natural gas compressors, wind turbines and much more. It is important to understand that, much like a mutual fund manager, you are relying on the expertise of your ELF manager to properly underwrite the leases to protect the fund’s assets. This is an industry where almost 60 percent or $600 billion out of the approximately $1 trillion spent domestically each year on business-essential equipment and capital goods, excluding real estate, is not purchased, but leased. You might be surprised to learn that even large stores where you shop on a regular basis lease everything in the store from the racks to the registers. In addition to the consistent streams of income, these funds can also provide some nice tax advantages. The ELF will typically pass through the accelerated depreciation they receive from owning the equipment. Remember, the fund technically owns the equipment and leases it to the company that uses it. The benefit to the company using it is they get to write off the lease expense, and the benefit to the ELF is they get the depreciation on the asset. This depreciation is usually accelerated in the early phase of the investment and will offset some of your tax liability on the income. This will, in turn, increase your taxable equivalent yield unless you invested in an ELF in your retirement account where the tax benefit is not relevant. Like any investment, there is always risk, and this is why you should look at this as an allocation in a well diversified portfolio that should include stocks, bonds, real estate, oil and gas, ELFs, and other asset classes to broaden your portfolio. By having these alternative asset classes, you can protect yourself from the day-to-day volatility of the stock and bond markets, because they are not publicly traded and the leases are long-term, usually seven to ten years. This type of fund can also function as a hedge against both inflation and recession. This is because equipment can be financed and then sold later at higher prices during periods of inflation, and leases may get renewed due to lack of available financing during recession. An easy analogy for this industry is the auto lease/financing business. Why do you think the automobile dealers offer leases? The biggest mistake most car purchasers make when leasing a car is focusing on the payment, but not what they are actually paying for their car or the residual value of the car when the lease expires. The dealer will lease you a car—rather their financing division will lease it to you—and you will make payments that include principal and interest. At the end of the lease, you either turn in the car or you can buy it based on the predetermined residual value. This value may still be higher than the car is worth at that time. They do this without you really negotiating on the price of the car or the residual value, but rather the amount of the monthly and down payment. This way you might have paid off 50 percent of the car by the time you turn it in, and the dealer wants 60 percent to buy it out. Or you can turn in the car and the dealer can make money again by selling the used car! Wouldn’t you like to be in that business? I always ask this question: Would you rather own the stock of a company, the bonds of a company, or lease them the equipment they need to be in business? Because if they cannot make their lease payments, their stock will not be worth anything and they are not going to be able to pay back their bond holders. But the equipment can be repossessed and re-leased or sold to their competitor.